My brother's a homestuck, so I can talk to him about it. It's infectious. It's great having friends to talk about it with. I have two friends offline I got into it. The rest of my friends are less enthusiastic. And yeah, Andrew Hussie is pretty darn good at world building/race building. Gotta hand it to him. I think that's one of the reasons why it's so popular. Most people have immense trouble creating such a large universe (or multiverse) on their own, but Hussie is just such a natural at it. I know, I read it this morning! It's all starting to come together! So now we basically know how Caliborn became Lord English, and my theory is that this Calliope from the alternative timeline, the one that became the predominant Cherub, needs to be guided to her dead session denizen, because that is some strong foreshadowing that she is the one who will be the key in having enough power to defeat her brother. Also, remember that thing where a player in a doomed timeline can fall asleep right before they cease to exist so when they wake back up in the alpha timeline, they have access to all previous memories from another timeline? I smell shenanigans here with Calliope, but that theory is a little half-baked and a bit more far-fetched. This update gives credibility to my prediction long ago that Lord English would ultimately be destroyed by Calliope sacrificing herself. And how about the fact that Dirk and Caliborn have the same denizen. This reeks of shenigans! Woo hoo! I'm listening to it right now! It was really good! I loved Eternity Served Cold when it was used in the comic and I'm glad to see there's more of it! My other favorite was Carne Vale. It's really sad to see Terezi so broken. I just want to hug her. Hussie will be in Florida two weeks before I get there. Arrrrgh! Dang it! Darn. Otherwise you would've had an excuse to get Fortyfourrzeronmten into Homestuck! Also, Sleet, check your Facebook please! I sent you something! It takes a little time. He's enough of a nerd that I think he'd definitely appreciate it. I've been reading almost non-stop for about three weeks and I have dreaded this day, where I would finally catch up to his latest update. I have to say though, AH's ability to dish out several pages every day is great. And a change in pace from most webcomics. 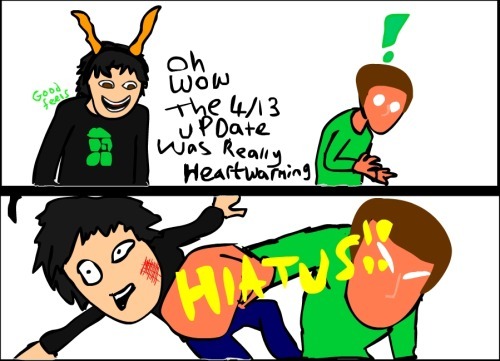 Homestuck doesn't get this long without updating that fast. It's only a few years old! Hussie was a God Tiered Waste of Space, he can't die unless it's heroic or just... Come to think of it Hussie kills so many characters that any death would be just. nevermind. It's kinda cool that he did. At the time it just seemed like random carnage and Hussie trying to make everything confusing. Now we can see that he harassed Caliborn (to an extent) and he wanted revenge. No one likes elevator music, let's just leave it at that. I dunno I kinda like Elevatorstuck. It's catchy and kinda fun in a kitschy way. I'm considering reading the entire series. Hussie actually went back to all those original past panels and added John's arm in them. Even the flash one. If you use Google Chrome, right click on the image and open it in a new tab. Then remove the "retcon" from the URL and it will bring you back to the original, unedited image. Doesn't work for the flash though. That's beautiful. Almost as beautiful as if it was there all along. You're in for a treat. Homestuck gets better. Since Act 6 started I just haven't been able to sit down and read it. Something about it makes it seem like it would be a pain to go through everything up till now. It's long but it's not a pain. It's totally worth it. You'll enjoy it. I really hope someone makes an anime version of Homestuck during this huge hiatus. I'm upset about the hiatus. But the update was still great! Hey people who are not wanting to get behind; this is your chance. Really?! The joke is becoming a reality? I'm upset about the hiatus.